My LP Gas Grill won't heat up like it used to. Help! Every now and then a customer will ask me how to fix a propane grill that starts up just fine but will not heat up past 200-250 degrees. When this happens, there is one common reason as well as a few other less likely causes. Let’s look at the most common cause and its fix first. How does this regulator sense a gas leak? Every time you shut down your grill, the regulator goes into a “bypass” mode which only allows a small amount of gas to flow. The next time you fire up the grill the tank valve is opened and the safety device looks for gas pressure to equalize on both the tank side and the grill side of the regulator. This can only happen if there is no leak in the system, the grill burner valves are closed, and enough time is given to the regulator to determine that all is well. Once that pressure is established, the safety device resets and allows a full flow of fuel to the grill. Knowing this, why do we have problems with a grill not heating up? Leaving one or more burner valves open before you open the tank valve is the most common cause for the safety switch to remain in “bypass” mode. Some fuel flows and often you can light the grill, but there is not enough fuel to heat up the grill normally. The fix is easy. Close the tank and all burner valves. Open the hood. Slowly open the tank valve fully and WAIT for 15 seconds. By now the safety has reset, and you can start your grill up normally. All should be well. 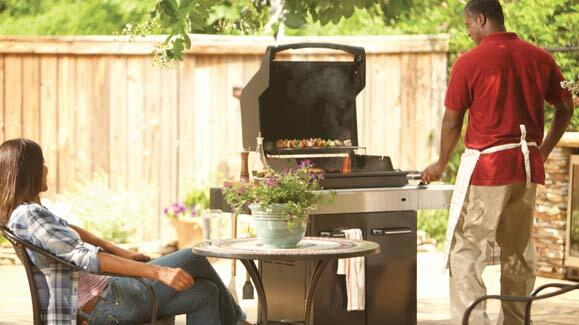 The second most common cause for the grill to not heat up also relates to that same safety device. If you open the tank valve to start the grill and then quickly turn on the 1st burner valve, the safety has not had enough time to reset and once again remains in “bypass” mode. The end result is the same as above, and so is the fix. Oddly enough, the longer the hose and gas pipe system is between the tank and all the valves, the longer it takes for gas pressure to equalize. As a result, some grills are more sensitive to this problem than others. OK, so what if you tried the above common fix and the grill still won’t heat up enough? The burner flame ports may be corroded or obstructed. If so clean these out with a brush. Burner air intakes can be blocked by debris. Often this is the work of spiders that will spin a web in this area. Once again, brushing this blockage away will solve the problem. 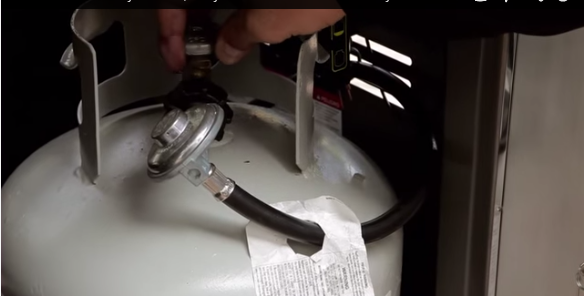 The gas hose from the tank and its connections could be leaking. Test for this by making up some soapy water and coating the hose and connections. Leaks will cause the soapy solution to visibly bubble up. If so then replace the hose assembly. Another reason the BBQ will not heat up is due to a kinked hose. This happened to me. I replaced the empty tank with a newly filled one, turned on the gas and lit the burners. All four burners started right away but even on high, I only had a low flame. My first thought was that I did not fully open the valve. I checked the valve and it was open all the way. I just had a full flame when the previous tank ran dry, so I new it was not a blockage at the burner. It was evening and kind of dark under my enclosed Vermont Castings Medallion BBQ, so I used my flashlight to look under my BBQ. 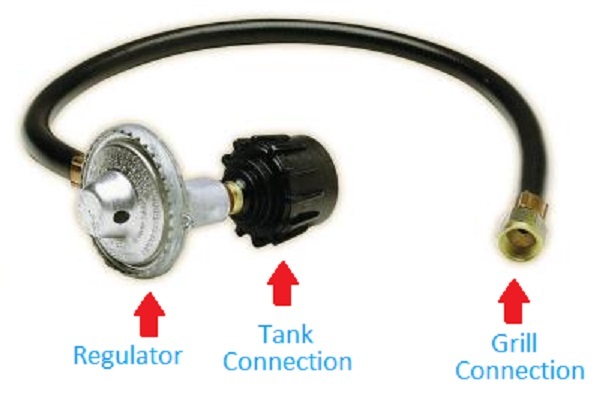 I discovered that when I had replaced the tank, I had kinked the hose when I attached the regulator to the new tank, severely reducing the flow. Once I straightened out the hose, I had my nice full flame back and it was back to grilling! !